Two Israelis have been killed and two others injured in a knife attack by a Palestinian in Jerusalem, police say. Jews are being slaugthered is Jerusalem by the sons of Muhammad. The third Intifada is in the pipeline. The victims are said to be from an ultra-Orthodox Jewish family who were walking to the Western Wall. The attacker was shot dead by police. In a separate stabbing incident hours later, a Palestinian wounded an Israeli teenager and was also later killed by police in Jerusalem. 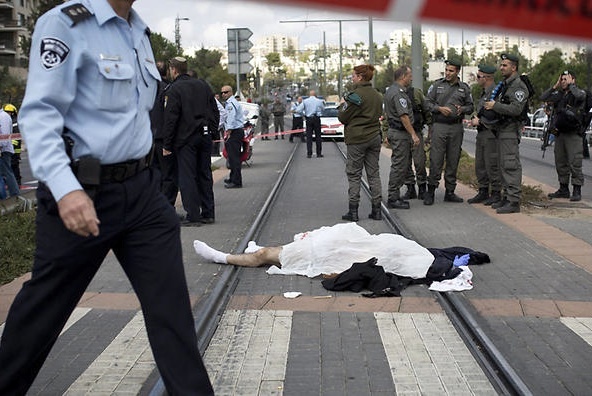 It comes two days after an Israeli couple were shot dead in the West Bank. Prime Minister Benjamin Netanyahu is due to hold an emergency meeting with Israeli security officials later on Sunday to discuss growing violence between Israelis and Palestinians. The bid to bring chaos and death to Jerusalem is on. The forces of Jihad assemble in Syria. One blue day, the Muslims will stop killing each other. They will agree that they must unite and fight the real enemy. The Zionist entry who “occupy” the land belonging to Muhammad, and his city “al-Quds”. Three outright lies are spoken about the Jews and the mountains of Zion. 1. There is no occupation. The free and democratic nation of Israel is liberated. Jerusalem was liberated from islamic occupation in 1967. 2. There is no “palestinian” people. They are all arabs. 3. There is no “Westbank” on the River Jordan. It is a mountain area. This mountain area is correctly called Samaria, the mountains of Zion. Repent or perish. Do not support the evils of all who fight the nation of Israel. Stand up for the Jewish people in their time of trouble. In the New Testament Jesus is questioned when he will restore the ancient Kingdom of Israel. There is no “westbank”. Let it be said one more time: Koran based Islam is evil. Koran based Islam is antisemitic. Koran based Islam deny the basics of modern history. Koran based Islam is leading all who belive in what is written to the everlasting fire of Hell.